If you think gadgets are getting too small as it is, you've got another thing coming: Rice University researchers have built an entire lithium ion energy storage device into a single nanowire thousands of times smaller than a human hair. 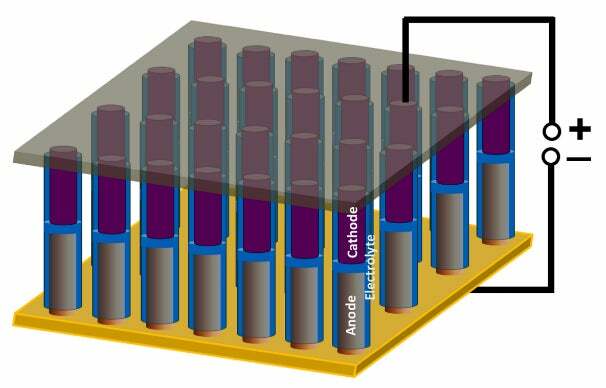 The researchers built two versions of their battery and supercapacitor hybrid: The first was built to prove that they could quickly charge and discharge lithium ions through the nickel and tin anode to the polyethylene oxide electrolyte and then to the supercapacitor-like polyaniline cathode. The second device had similar capabilities packed into a single nanowire. The device consisted of thousands of nanowire devices, each about 150 nanometers wide, arranged into centimeter-scale arrays. The Rice lab of Professor Pulickel Ajayan first developed nanobatteries last December. Since then, the team has developed a new process that allows them to install a capacitor inside the nanowires. The polyaniline cathodes are drop-coated onto a polyethylene oxide gel-like electrolyte that stores lithium ions and serves as an electrical insulator between nanowires in an array. The experimental battery stands about 50 microns tall, is about the diameter of a human hair, and is almost invisible when viewed edge-on. The size of the batteries can be easily scaled up, as they can be as long and wide as templates allow. The researchers believe their creation will be the smallest-ever battery and that it could be used as a rechargeable power source for future nanoelectronics. So far, the researchers think that their nanowire devices show good capacity but it drops off after about 20 cycles. So they are fine-tuning the materials to increase their ability to repeatedly charge and discharge. The next step for the device is optimization. The scientists have already begun tinkering with the thickness polymer separator and exploring different electrode systems that could lead to improvements.